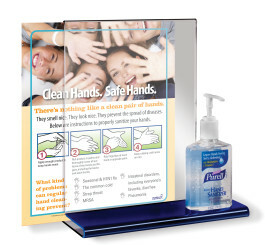 Educate staff and the general public on the importance of hand hygiene with this unique counter display. Includes 1 of 3 different full-color 8-1/2 x 11" Hand Hygiene Signs. You can also insert your own sign. Click on image enlargement to review all 3. Pump shown for illustrative purposes only and is not included. Sign is printed in full-color on thick glossy paper. We can easily personalize any of our 3 signs for this holder. There is a minimum order of 10 Deluxe Pump Holders and a one-time $75.00 set-up fee to add your logo. Please call one of our Customer Service Representatives at (877) 646-5877 for additional details and pricing.